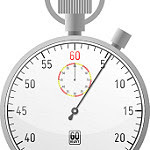 don't get caught: Are experts really "too busy" for communicating? Sometimes, I start my workshop on how to Be an Expert on Working with Experts (next session June 19) by asking the professional communicators present to give me one word that describes the experts with whom they work. The adjectives vary, but "busy" nearly always tops the list. I'd call that sign-number-one that your efforts to get experts to cooperate with your communications projects--media interviews, donor meetings, testimony, public outreach--aren't working. 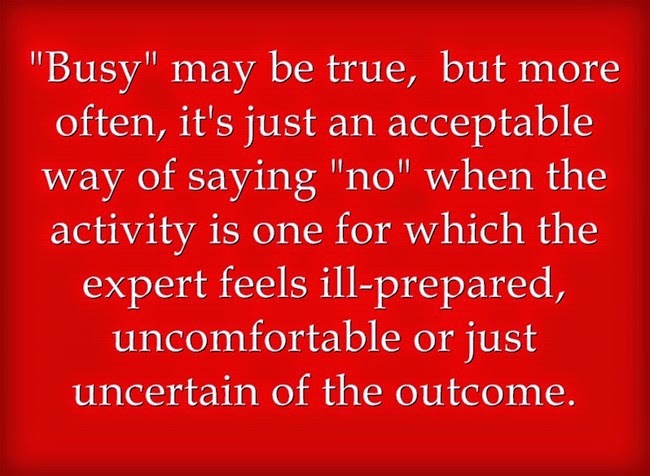 That's because "busy" often is just an acceptable way of saying "no" when the expert feels ill-prepared, uncomfortable or just uncertain of the outcome. The communicator who stops at "busy" may never discover an easy way to help the expert get around, over or through that discomfort. You may be missing the chance to answer a simple question, offer coaching, or find the next great science or policy communicator if you stop at "busy." At the same time, communications pros, with their imprecise and often last-minute requests, look an awful lot like unorganized piles of work with little payoff that matters to the expert, making "no" an efficiency. Who wouldn't be busy then? 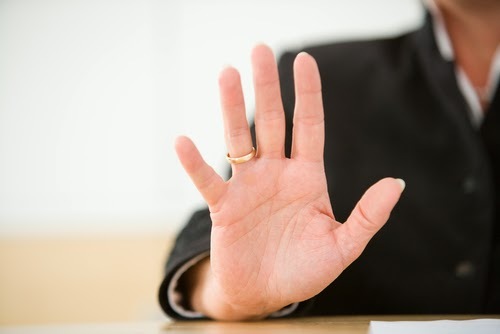 One of my favorite experts called me once upon a time to say "no more interviews." When I probed why, he told me a formula: "I get 10 percent of my calls from reporters and they take up 80 percent of my time." I had an easy fix for him. No more one-on-one interviews, except in special cases. More conference calls with groups of reporters. Better filtering. Problem solved--but only because I didn't stop at "talk to the hand." That's why we spend time in the workshop unpacking the personalities and priorities of experts, how the typical communicator's request comes across, and realistic ways communicators can identify and work with rather than at odds with the expert's motivations and priorities to achieve your public communication goals. We also talk about working with big-ego experts and those for who whom the public spotlight prompts vulnerabilities, and how to support them both without becoming roadkill or missing a cue. All registration for this workshop closes in less than two weeks, at midnight EST on June 11. Many smart communicators come with their teams. At the PAN conference, one table of participants came from all the functions in a single public affairs office, from director to webmaster. It's a smart way to make sure you can reinforce the learning long after our time together is over. @dontgetcaught great workshop!! Highly recommend! !